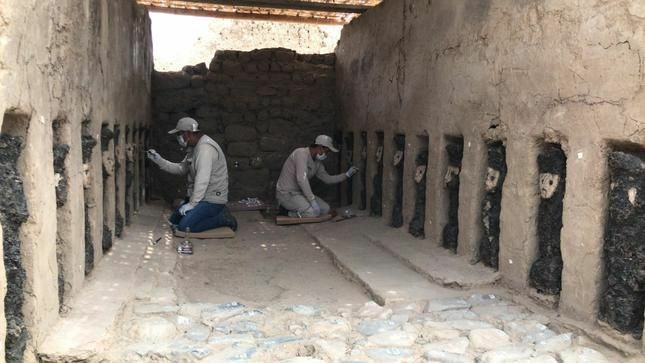 An ancient passageway full of creepy wooden statues has been discovered in Peru in the abandoned city of Chan Chan. The 19 statues are at least 750 years old, the country’s Ministry of Culture said, and they are believed to be idols belonging to the pre-Columbian civilization. Chan Chan, located about three miles from the city of Trujillo, was the capital city of the Chimú empire between 900 and 1470 A.D.—when the Incas conquered it and the civilization. In its heyday, Chan Chan was incredibly wealthy. It was split into nine citadels and was lined by high, thick earthen walls which were often decorated with extensive friezes. It was recognized as a UNESCO World Heritage Site in 1986. At a press conference on Monday, Patricia Balbuena, from the Ministry, unveiled the newly discovered statues. She said the 19 wooden idols were covered in clay masks. They were found by archaeologists, curators and engineers working at the site in a citadel passageway. The corridor, which stretches over 100 feet, leads to a ceremonial courtyard. Each of the wooden statues is around 27 inches tall and they appear to represent anthropomorphic characters, carrying a scepter in one hand and a circular object—potentially a shield—in the other. "It's an important discovery for its age and the quality of its decoration," Balbuena said, according to AFP. According to Smithsonian Magazine, at its peak Chan Chan was home to 60,000 people. The city had a strict social structure—it was run on the idea that not all people were created equal. After the Chimú empire collapsed, the city fell into decline and by the time the Spanish conquistador Francisco Pizarro arrived in the 1530s, the city had mostly been abandoned.